We are very excited to have Coach Sahil M from Addicted to Tumbling coming to Norwich all the way from Canada! 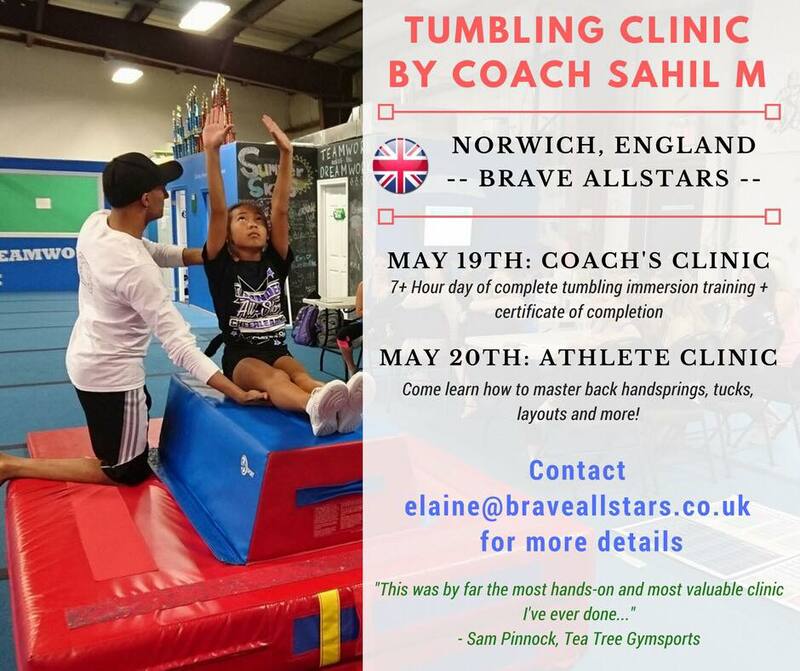 Brave Allstars will be hosting an intensive coaching clinic which covers: the bio-mechanics of tumbling, mental blocks, injury prevention, spotting techniques, a Q&A along with a lot more too so it’s safe to say it will be a phenomenal experience and a full on day. Along with our coaches clinic on the Saturday, we are lucky enough to be holding a number of athlete skill clinics on the Sunday; these clinics are kept to very small numbers but we are excited to be able to offer some of our athletes this opportunity and cannot wait to expand our knowledge and put it to great use in all of our classes. pleased to announce our seven Allstar Cheerleading teams for 2018/19 season. Each person that attended tryouts, has been given a team placement depending on their age, ability and experience. 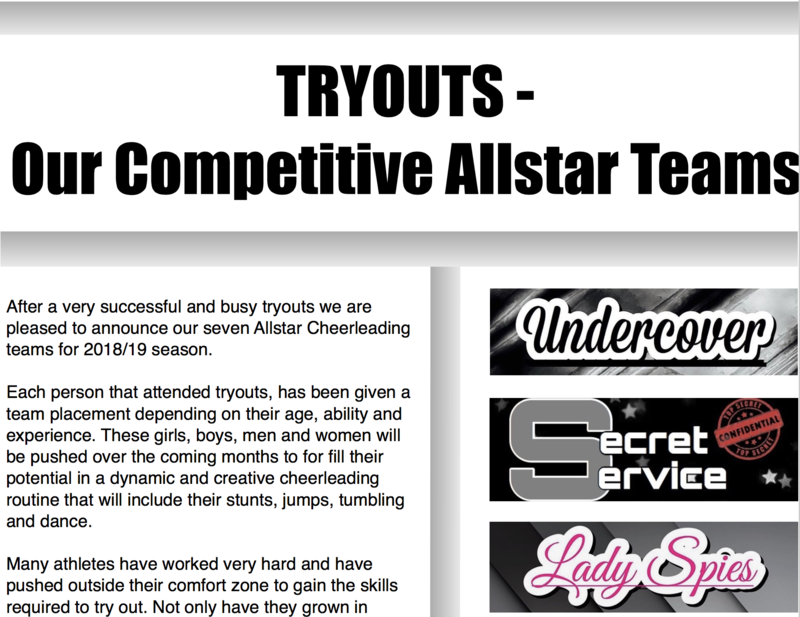 These girls, boys, men and women will be pushed over the coming months to for fill their potential in a dynamic and creative cheerleading routine that will include their stunts, jumps, tumbling and dance. Many athletes have worked very hard and have pushed outside their comfort zone to gain the skills required to try out. Not only have they grown in strength, flexibility and determination, we have seen friendships flourish and individuals supporting and encouraging their class mates, as well as celebrating with them in their success. 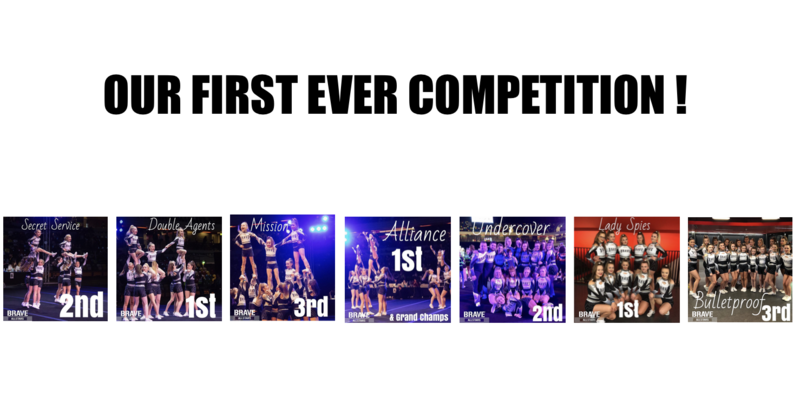 We are proud of each and every athlete at Brave and we cannot wait to see what the season has in store for them. Our stepping stone into the world of competitive cheer is our pre competition team, this starts in November and runs through until March. It is a great way for children and teenagers to get a taste of working towards a two and a half minute routine with the focus on repetition, perfection and performing at our showcase with our competitive teams at the showcase in March. 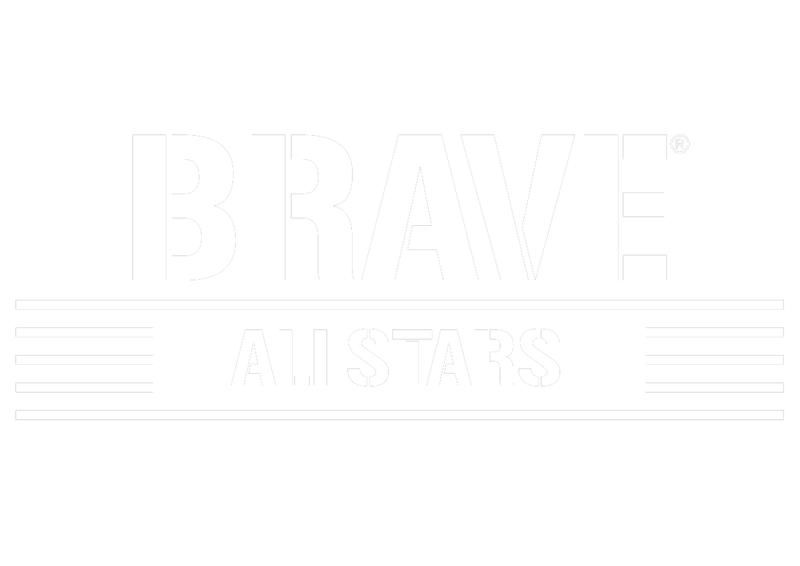 If you or your child is interested in joining a competitive team next season at Brave Allstars, please contact us via our contact page. Our training kits create a sense of unity and belonging with in our team practices. 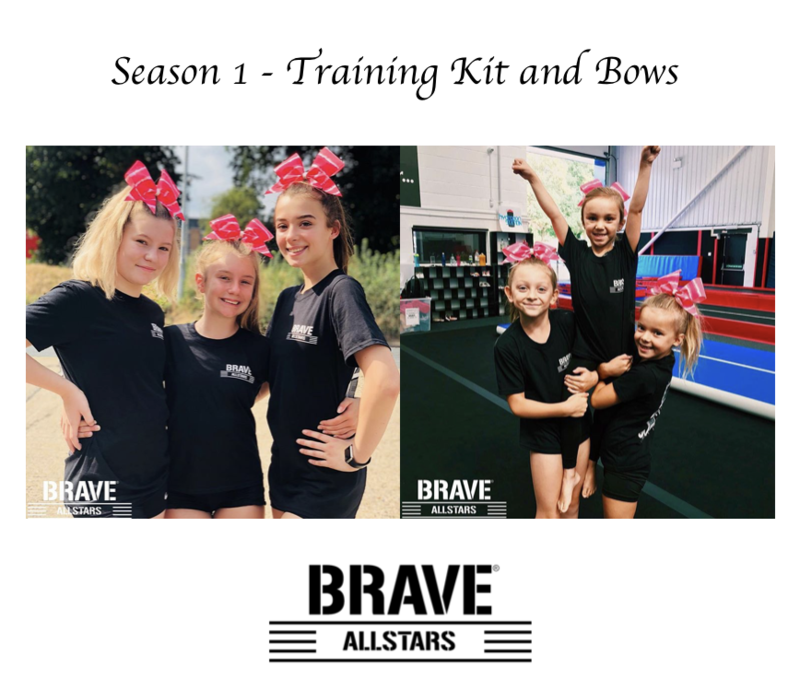 All competitive athletes, no matter the age, size or team have a Brave Allstars ‘Go Forth and Conquer’ black t-shirt and the girls also have a coral pink tye dye bow. We love that having a training kit makes everyone on the mat look as similar as if they were in their uniforms. No only do they look great and are practical to wear, this allows us as coaches to see the visual effects of the routine as close to the final comp day product as possible. The designs didn’t come without a lot of deliberation and discussion, however it is safe to say that we are very happy with our decision. Our first competition uniforms are black, silver, grey and white with an abundance of sparkle! Encompassing all of the ideas that we’ve had over the years that Brave has been in the pipeline we finally have our finished uniform including ombre sleeves, cut out shoulders and diamante stripes on the shorts. This design looks striking on the mat, the bold changes of colour and the direction of the lines creates the perfect visual impact for the teams. Our high waisted shorts are flattering on all and the design is similar for the men’s trouser. We can’t wait to see them on the competition floor for the first time in 2019. 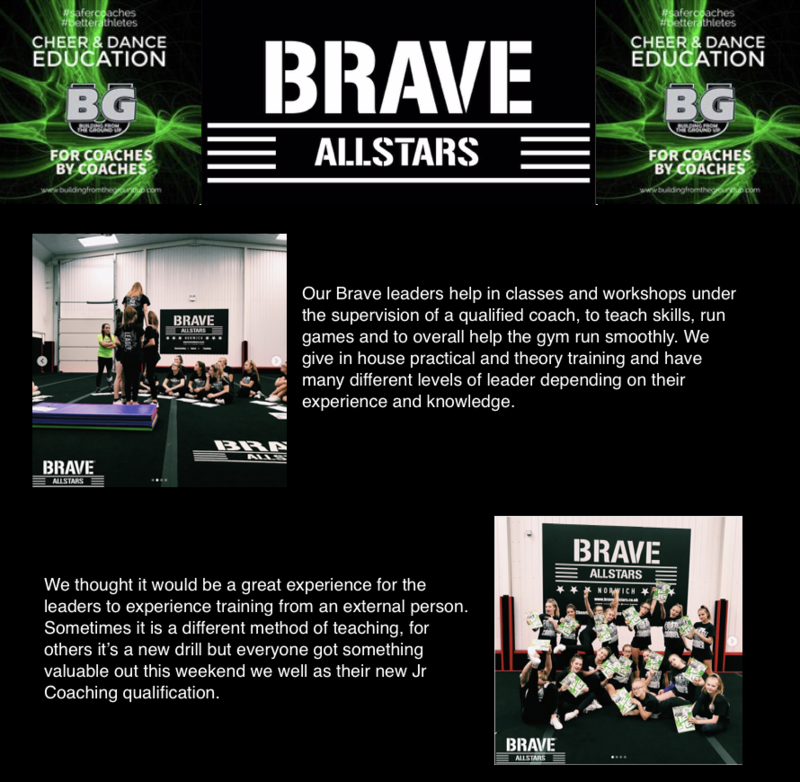 Our Brave leaders help in classes and workshops under the supervision of a qualified coach, to teach skills, run games and to overall help the gym run smoothly. We give in house practical and theory training and have many different levels of leader depending on their experience and knowledge. We thought it would be a great experience for the leaders to experience training from an external person. Sometimes it is a different method of teaching, for others it’s a new drill but everyone got something valuable out this weekend we well as their new Jr Coaching qualification. Thanks for visiting us BGU! We hope to see you again soon. 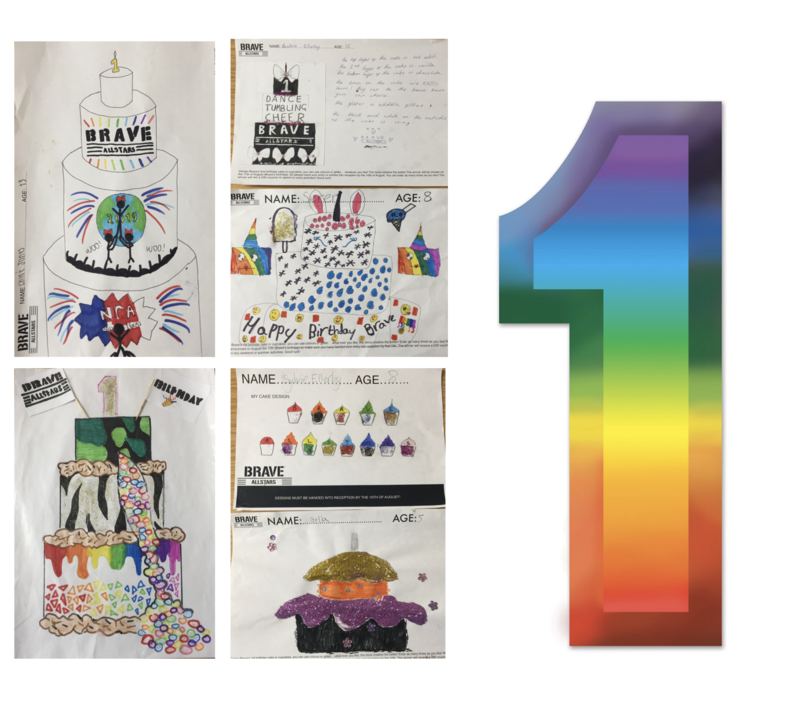 August 2018 marks the first birthday of Brave Allstars. We would like to thank everyone; athletes, families, leaders and staff for making our club what it is today. Many people have gained skills, friends and life lessons that will never be forgotten. Whilst discussing our favourite moments over a milkshake, all of them had in common our athletes progressing or doing something rather funny during class or at our special events Christmas, Easter or Halloween events. We can’t wait to see what the future holds for them. OUR FIRST EVER COMPETITION ! 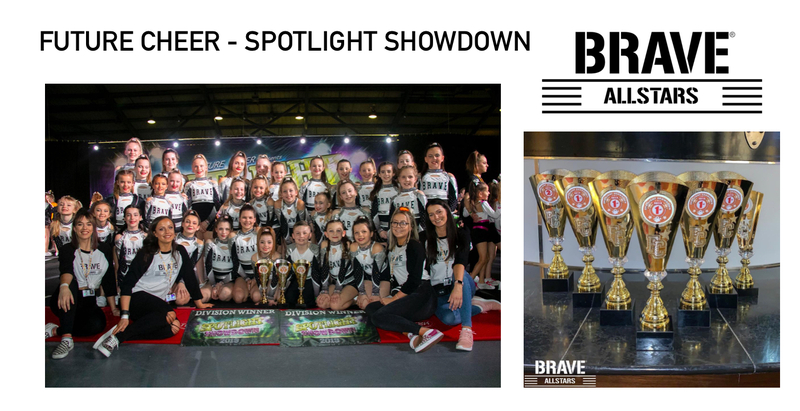 Brave’s first competition was at Legacy, Just Believe 2019 held at Copper Box Arena in London this February. All our athletes were super excited and have trained so hard to do their best on competition day. Most are new to Cheerleading and this was the first time that many athletes and families had seen a competition, learning how to do their hair and make up, visiting the pop up shops and watching other teams was almost as exciting as performing! Brave’s goal for this competition wasn’t about the trophies and placings, but the experience and being confident in a clean routine. We are delighted to say we achieved it all and are very proud of what our athletes are becoming. The teams bonded together, supported everyone, were polite and have learnt how to perform with their friends. Watching other teams and meeting athletes was not only exciting but has encouraged them to keep working hard and pushing to be the best they can be. All teams placed in the top three, and we even left with a grand champion banner! Secret Service – This team competed against some of the strongest mini teams, they were a joy to watch: smiling, performing, singing, hitting all of their stunts and tumbles and making it look easy. A well deserved 2nd place. Double Agents – These girls were out to show the judges what they could do, and they smashed it! Difficult tumble passes make to look easy, stunts that looked like they could be there all day, congratulations on your 1st place. Mission – Great work from this youth team: remembering their counts, being strong, sharp, confident and performing. Again this was a tough division and they excelled above expectations, bringing their parents to proud tears. It was a 3rd place for Mission! Alliance – This team already had us on cloud nine during their training sessions in the lead up to the competition. They are by far the team that have progressed the most and have been caught by the love of cheer. Alliance earned themselves a 1st place, through all of the excitement and emotion we were very surprised to hear Alliance called out for a second time – for a GRAND CHAMPION win, a title that the team were not aware existed and they were super excited when we got to explain that the banner they had been awarded meant they were the highest scoring level 1 team across multiple divisions, a fantastic achievement. Bulletproof – A fierce, clean, and jam packed routine to be proud of. Bulletproof are in what we think is the toughest division in the country, holding their own against these experienced and title winning teams was what they have been fighting for. Congratulations on your 3rd place. Undercover – With parents of athletes in our programme competing in this team, they are our most ‘senior’ team in the programme. These men and women fought hard and performed harder. Looking like seasoned professionals even with new skills being competed for most. The high difficulty and execution in this routine earns Undercover 2nd place. Lady Spies – Looking at this team you can see all athletes are very similar in size, they have defied all odds being able to compete a creative and difficult stunt sequence that kept the audience on their toes. We loved to see the flyers showing off the needles they have worked hard for. This girls were brought to tears when they were awarded their 1st place.